Home » Exchanges » Coinbase vs. Kraken Comparison: Which One to Choose? Coinbase vs. Kraken Comparison: Which One to Choose? LocalBitcoins, CoinMama, GDAX, Kraken, and Coinbase are all well-known exchanges, but if you are new to the world of buying and selling cryptocurrencies, chances are, you don’t know which exchange to choose. Coinbase and Kraken are two of the most commonly recommended options for buying and selling cryptocurrencies, due to their benefits. In this Coinbase vs. Kraken comparison, we’ll show you the key differences between both options, so that you can make an educated decision when opting for a certain exchange platform. This digital currency platform was founded by Fred Ehsram and Brian Armstrong in 2010. It has 9 million users, making it the biggest Bitcoin exchange. The company is settled in San Francisco and operates in 32 countries across the globe, and its wallet is available in 190 countries. Coinbase has two essential products – retail exchange of cryptocurrencies for fiat currency, and GDAX (Global Digital Asset Exchange). One more thing worth noting is that this platform offers an API for developers. Founded in 2011 by Payward, Inc., Kraken is well known for its high-security level, and liquidity, having hundreds of thousands of users. Kraken is a number one exchange in the world, where you can purchase and sell cryptocurrencies as well as exchange them. This company is committed to innovation and improvement. Therefore, it is not surprising that it is the first one that managed to pass a cryptographically audit. Coinbase is listed as beginner friendly option, and has become a leader in the cryptocurrency exchange space. The goal of Coinbase is to make purchasing, selling, and storing cryptos as simple as possible. On the other hand, Kraken is absolutely not “beginner friendly platform. Both platforms allow users to purchase Bitcoin, Ethereum, and other cryptocurrencies. However, they provide this service in different ways. 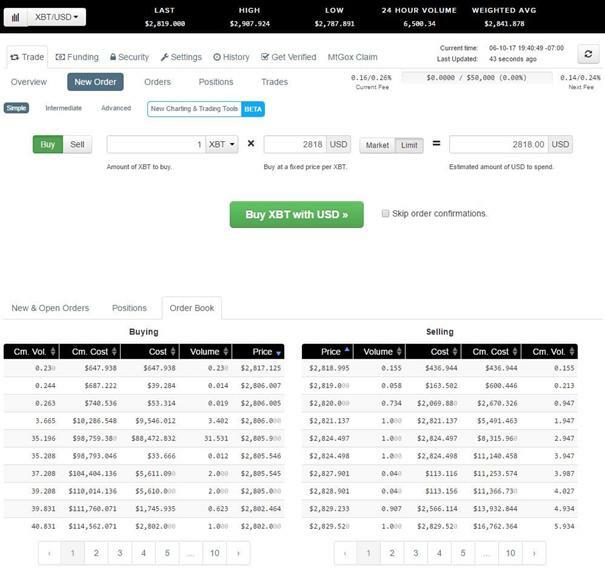 Kraken operates as a crypto exchange, and offers great volume, responsive customer support and many advanced trading features. You can think of Kraken as being similar to a forex exchange, because here users are able to trade currency pairs with each other, which leaves more room for human error, than Coinbase does, particularly for those who have no previous experience in trading cryptos. Verify your account on an exchange. Deposit FIAT currency to the exchange via bank transfer. Wait for your deposit to hit your account. This usually takes 1-5 business days. Trade your FIAT currencies for cryptocurrencies. It’s important to note that Coinbase allows you to lock in your price more quickly. Coinbase is a stable, well-designed platform that aims to simplify purchasing crypto by removing many of the negative aspects found at exchanges. The platform is made in such a way that provides security to customers’ funds, so even novices can store their coins and use the platform easily. Coinbase also offers a mobile app, allowing you to buy, sell, and send cryptocurrency on the go, and you can also purchase crypto with both credit/debit cards and bank transfers. 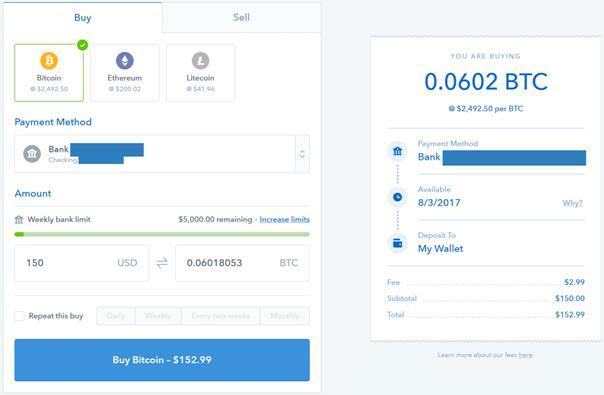 Below you will see what the Coinbase purchasing process is like for each payment method. Verify your account at Coinbase. Purchase Litecoin, Ethereum, and Bitcoin at their set price. After a few days of processing time, you will receive the agreed upon amount of cryptocurrency that you bought. Verify your account and a Credit Card. Purchase Litecoin, Ethereum, and Bitcoin at their set price and receive them instantly. NOTE: Coinbase bank transfer and credit card buying limits vary by user. Credit card limits are determined by verification status, buying history, and account age. Bank transfer purchases are a great option for those who are hoping to buy larger amounts, because you can instantly have access to higher limits after verification. It’s easy to see the benefits of Coinbase when using a credit or debit card. You will be able to use an often-preferred payment method, and also to receive your cryptocurrency instantly. Users can also benefit when using a bank transfer to buy cryptocurrency, if they’re looking to lock in a price as soon as possible. 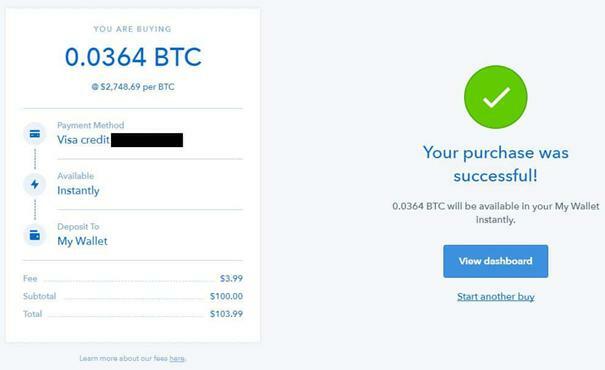 Unlike on Kraken, Coinbase allows you to lock in your purchase price, before your bank transfer is processed, which can be useful if you’re expecting prices to rise quickly. It’s important to note that while your bank transfer is being processed, you cannot transfer cryptocurrencies from your account. One more thing worth noting is that, regardless of which payment method you use, the fees and price will be clearly shown at the time of your purchase. Coinbase does charge fees for their service, and the price is based off exchange rates, insuring a fair price. These two companies offer different services and payment methods. When it comes to pricing, Kraken comes out ahead in this comparison, as it offers lower fees than its competitor. Even though fees vary for takers and makers, Kraken’s trading fees are generally below .36%. 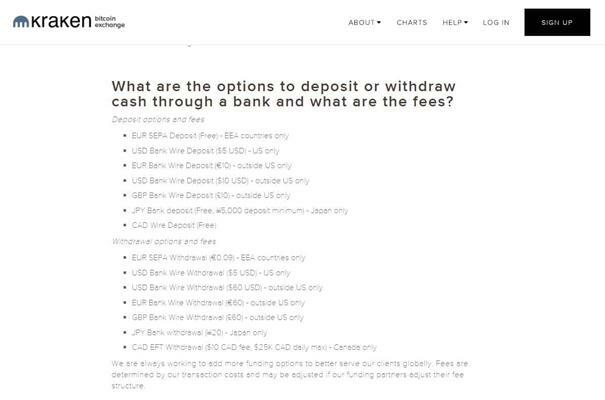 Trading fees vary by currency pair. These fees can be viewed here. However, you will have to pay additional fees when depositing or withdrawing from your account. For more information, see the image below. The platform accepts credit/debit cards. This naturally carries higher fees. This is due to the risks for fraudulent charge backs and the fees charged by credit card companies. 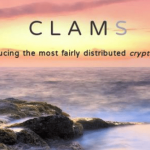 The platform provides additional services that Kraken does not. On Coinbase, credit/debit card purchases carry 3.99% fees, while bank transfer purchases typically carry 1.49% fees. For more details, check the image below. Kraken is likely the better option for you if you’re hoping to buy a variety of altcoins. 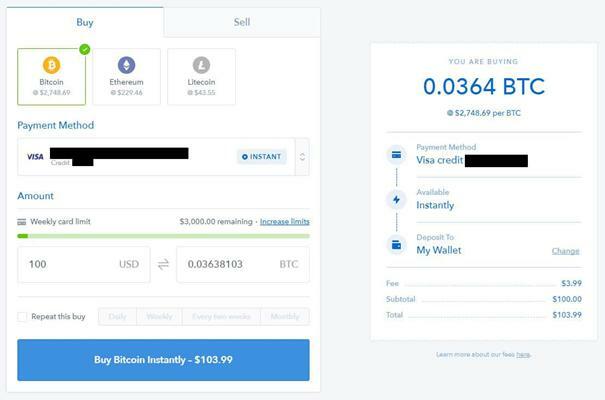 Coinbase only offers users the ability to buy and sell Bitcoin, Ethereum, and Litecoin, so if you want to work with something that is not Bitcoin, Litecoin or Ethereum, then forget about Coinbase. On the other hand, if you do want to work with only these three cryptocurrencies, you should know that Coinbase is the leader in Bitcoin, Ethereum, and Litecoin exchange. On the other side, Kraken is the largest exchange in liquidity and offers far more options for trading cryptocurrencies and fiat currencies. With Kraken, you can trade US dollars, Canadian dollars, Japanese yen, British pounds, and Euros. Available cryptocurrencies are Bitcoin (BTC), Ethereum (ETH, Litecoin (LTC), Monero (XMR), Gnosis (GNO), EOS (EOS), Augur REP tokens (REP), Melon (MLN), Zcash (ZEC), Tether (USDT), Stellar/Lumens (XLM), Ethereum Classic (ETC), Ripple (XRP), Dash (DASH), and Dogecoin (XDG). Coinbase serves customers in the United States, United Kingdom, Australia, Austria, Sweden, Switzerland, Netherlands, Norway, Denmark, Finland, Slovenia, Spain, Malta, Monaco, Cyprus, Czech Republic, Singapore, Slovakia, Portugal, San Marino, Poland, Latvia, Liechtenstein, Ireland, Italy, Greece, Hungary, Canada, Croatia, Belgium, and Bulgaria. Kraken is available worldwide, with exceptions. Your account status will likely say “pre-verified” if your country or region is not eligible for Kraken’s services. Coinbase and Kraken were launched in 2012 and 2011 respectively and they were both pioneers in servicing the purchase and sale of cryptocurrency. Both companies are currently based out of San Francisco, California, and as US based companies, whose customers include US residents, both platforms are fully committed to complying with all US regulations and laws. With millions of dollars being held on these sites, security of funds is one of their users’ top concerns, so both Coinbase and Kraken adhere to industry best practices for storing both fiat currency and cryptocurrency funds. Both sites offer an array of security features for protection of users’ information, including 2-way authentication method, for securing personal accounts. Both companies keep the majority of users’ funds in cold storage, which protects these funds from a potential hack or other security breach. Company and user funds are segregated. This means that user funds aren’t used for company operational purposes. Coinbase takes security one step further. US customer’s USD wallet balances are covered up to $250,000 by FDIC insurance, and cryptocurrency funds held online are insured by a syndicate of Lloyd’s of London. Kraken also requires you to submit your personal info when making your account and trading Bitcoins, and offers PGP encryption for email communication and a global setting lock. These measures are a bit strict and some would say too much. However, it can be said that these sites offer unparalleled security levels. It’s important to note that neither site will be held responsible for any lost funds if your personal account is directly compromised, due to you improperly securing it. It’s no secret that when it comes to most crypto exchanges, customer service leaves much to be desired, because recent price gains have brought a huge increase of new crypto investors and most crypto sites have struggled to keep up with their rapidly rising user bases. The good thing is that both platforms have an extensive FAQ section for general questions. Coinbase offers customer support through email, phone, and their help center, and they seem to respond to customer support issues in a reasonable time frame. Some users claim that some problems raised to the site’s customer support service have been left unresolved for over 24 hours, but such complaints are likely to tarnish the prominent reputation the company has garnered over time. Kraken has typically been known for having good customer service and they offer support through email and their help center. However, there seems to be a lot of new recent complaints and the majority of customer complaints against Kraken are about how difficult they can be to get ahold of and how long they take to resolve issues. As you probably concluded by now, there is no clear winner in the battle of Coinbase vs. Kraken. Ultimately, it comes down to personal preference, since both platforms are excellent options for digital assets. Coinbase is the better option for those who are new to the world of cryptocurrencies, and simply don’t want to bother with a complicated exchange process. Coinbase is also the only option of the two that accepts credit and debit cards, and is also a global market, and many people choose it over other trading platforms. On the other hand, if a large number of available cryptocurrencies and super low fees are important to you, then Kraken is a better option. It does require more technical knowledge and their support may be having issues keeping up with the spike in new customers. However, it is a good choice for anyone who wants a safe place for cryptocurrencies exchange. It has slightly higher fees than most exchanges. STAY AWAY FROM KRAKEN!!!. Multiple problems with this exchange. Bad support. You will lose money. Is this still the case February 25? The author indicated recent problems ………hopefully its a temporary condition only. I use Kraken for XRP and XLM. The site isn’t bad, and once you learn to navigate it’s actually pretty straightforward. Coinbase I only use for fiat pairing direct back into my account.